Sensory integration difficulties have been reported in autism, but their underlying brain-circuit mechanisms are underexplored. Using five autism-related mouse models, Shank3+/ΔC, Mecp2R308/Y, Cntnap2−/−, L7-Tsc1 (L7/Pcp2Cre::Tsc1flox/+), and patDp(15q11-13)/+, we report specific perturbations in delay eyeblink conditioning, a form of associative sensory learning requiring cerebellar plasticity. By distinguishing perturbations in the probability and characteristics of learned responses, we found that probability was reduced in Cntnap2−/−, patDp(15q11-13)/+, and L7/Pcp2Cre::Tsc1flox/+, which are associated with Purkinje-cell/deep-nuclear gene expression, along with Shank3+/ΔC. Amplitudes were smaller in L7/Pcp2Cre::Tsc1flox/+ as well as Shank3+/ΔC and Mecp2R308/Y, which are associated with granule cell pathway expression. Shank3+/ΔC and Mecp2R308/Y also showed aberrant response timing and reduced Purkinje-cell dendritic spine density. Overall, our observations are potentially accounted for by defects in instructed learning in the olivocerebellar loop and response representation in the granule cell pathway. Our findings indicate that defects in associative temporal binding of sensory events are widespread in autism mouse models. On a windy day, hearing the sound of wind makes many individuals squint in anticipation in order to protect their eyes. Linking two sensations that arrive within a split second of one another, such as sound and the feeling of wind, is a type of learning that requires the cerebellum, a region found at the base of the brain. When done in a laboratory setting, this particular form of learning has been dubbed eyeblink conditioning. Individuals with autism tend to have difficulties with appropriate matching of different senses. For example, they have trouble identifying a video that goes with a spoken soundtrack. They also do not learn eyeblink conditioning the same way that other individuals do. However, it is not known which circuits in the brain are responsible for their difficulty. Kloth et al. now investigate this issue by asking whether versions of genes that increase the risk of autism in humans also disrupt eyeblink conditioning in mice. They tested five types of mouse model, each with a different genetic mutation that has previously been linked to autism. All five of these mutations cause defects in different cell types of the cerebellum, and all mice have abnormal social and habitual behaviors, similar to autistic people. The tests involved shining a bright light at the mice, which was followed, a split second later, by a puff of air that always causes the mice to blink. After this had occurred dozens of times, the mice started to blink earlier, as soon as the light appeared, in anticipation of the puff of air. To test whether the mice had successfully learned to respond to just the bright light, the light was also occasionally flashed without a puff of air. Kloth et al. found that the mice generally performed poorly in eyeblink conditioning, although in different ways depending on which cell types of the cerebellum were affected by the genetic mutations. Some mice blinked too soon or too late after the light appeared; others blinked weakly or less frequently; and some did not blink at all. This suggests that autism can affect the processing of sensory information in the cerebellum in different ways. This work is important because it demonstrates that a form of split-second multisensory learning is generally disrupted by autism genes. If defects in cerebellar learning are present early in life, they could keep autistic children from learning about the world around them, and drive their developing brains off track. Hundreds of autism genes have been found. Linking these genes to a single brain region identifies the cerebellum as an important anatomical target for future diagnosis and intervention. In autism spectrum disorder (ASD; hereafter referred to as autism), atypical sensory processing is widely reported starting in infancy (Leekam et al., 2007; Markram and Markram, 2010; Dinstein et al., 2012). In addition to early-life abnormal processing of single sensory modalities (Leekam et al., 2007), more complex deficits become apparent as early as 2 years of age, a time when autistic children attend poorly to natural combinations of spoken stimuli and natural visual motion (Klin et al., 2009), a circumstance that calls upon the ability to integrate, from moment to moment, information from two sensory modalities, hearing and vision. Abnormalities of sensory responsiveness are strongly correlated with severity of social phenotypes in high-functioning autism patients (Hilton et al., 2010). Taken together, these observations suggest that abnormal processing of multiple sensory modalities on subsecond time scales might impede the acquisition of cognitive and affective capacities that are affected in autism. Abnormal sensory processing in autism is likely to arise in part from genetic mutations and variants that predispose for neural circuit dysfunction. To investigate the ability to associate two near-simultaneous sensory inputs, we used delay eyeblink conditioning, a form of learning that is found in multiple mammalian species (McCormick and Thompson, 1984; Ivarsson and Hesslow, 1994; Boele et al., 2010; Heiney et al., 2014). Persons with autism show alterations to delay eyeblink conditioning (Sears et al., 1994; Oristaglio et al., 2013). Delay eyeblink conditioning depends on plasticity in the cerebellum, a common site of anatomical deviation in patients with autism, and cerebellar gross and cellular malformation are common features of autistic brains (Wang et al., 2014). These factors led us to search for aberrations in the quantitative parameters of delay eyeblink conditioning. Autism is among the most heritable of neuropsychiatric disorders (Gaugler et al., 2014), and hundreds of autism risk loci have been identified (Abrahams and Geschwind, 2008; Devlin and Scherer, 2012; Stein et al., 2013). We examined five mouse models that both recapitulate mutations that occur in human idiopathic and syndromic autisms and display phenotypes reminiscent of human autism (Abrahams and Geschwind, 2008; Banerjee-Basu and Packer, 2010; Abrahams et al., 2013; http://gene.sfari.org). Four of the models incorporate global mutations with strong expression in the cerebellum: Shank3+/ΔC, the C-terminal deletion model of Shank3 associated with Phelan-McDermid syndrome (Kouser et al., 2011, 2013); Mecp2R308/Y, a mild truncation model of Mecp2 associated with Rett syndrome (Ben-Shachar et al., 2009; Shahbazian et al., 2002a; Moretti et al., 2006; De Filippis et al., 2010); Cntnap2−/−, a knockout of Cntnap2 associated with cortical dysplasia-focal epilepsy syndrome (Peñagarikano et al., 2011); and patDp/+, a mouse model of the 15q(11–13) duplication syndrome closely linked to autism (Nakatani et al., 2009; Tamada et al., 2010; Piochon et al., 2014). A fifth model, a knockout of the tuberous sclerosis protein L7-Tsc1 (L7/Pcp2Cre::Tsc1flox/+ and L7/Pcp2Cre::Tsc1flox/flox), specifically affects cerebellar Purkinje cells (PCs) (Tsai et al., 2012). Because different circuit defects might have differential effects on the properties of eyeblink conditioning, we analyzed learning deficits quantitatively in terms of two major features of learning: the probability of generating a response, reflecting the learning process itself; and the magnitude and timing of individual responses, reflecting the neural representation of the learned response. All five mouse models examined in this study have previously shown face validity for autism (Silverman et al., 2010), with alterations in social behavior, ultrasonic vocalization, and repetitive behaviors. Some, but not all, of these models show disruptions of gross motor function. Cntnap2−/− mice and patDp/+ mice show enhanced performance on a gross motor task, the accelerating rotarod (Nakatani et al., 2009; Peñagarikano et al., 2011); but the other three mouse models do not (Shahbazian et al., 2002a; Kouser et al., 2011; Tsai et al., 2012). In addition, patDp/+ has been tested and shown to have alterations in gait (Piochon et al., 2014). We surmised that a more refined assay might reveal cerebellum-specific functional disruptions. We subjected head-fixed mice to delay eyeblink conditioning (Figure 1A; Arlt et al., 2010; Heiney et al., 2014; Piochon et al., 2014). Over the course of training with a light-flash conditioned stimulus (CS; ultraviolet LED, 280 ms) and a co-terminating corneal-airpuff unconditioned stimulus (US; 30 ms), a conditioned response (CR) developed with a gradually rising time course that peaked at the time of the US onset (Figure 1C). During each training session (220 trials), a small number (10% CS-only trials) of unpaired CS (i.e., no US) trials were used to characterize the complete CR time course, including the onset time, the rise time, and the peak time (Figure 1B). Finally, to probe savings, an aspect of eyeblink conditioning that depends in part on the deep cerebellar nuclei (DCN), after the 12-day initial training period we tested extinction and reacquisition (Figure 1D; Medina et al., 2001; Robleto et al., 2004; Ohyama et al., 2006). Extinction consisted of 110 trials of CS-only trials and 110 trials of US-only trials over four daily sessions and led to the near-disappearance of the CR (Figure 1D). Three sessions of reacquisition (identical to acquisition) resulted in a rapid return of the CR (Figure 1D). Delay eyeblink conditioning in head-fixed mice. (A) Experimental setup. A mouse with an implanted headplate is head-fixed above a stationary foam cylinder, allowing the mouse to locomote freely. Eyeblink conditioning is carried out by delivering an aversive unconditioned stimulus (US, airpuff) that coterminates with a conditioned stimulus (CS, LED) to the same eye. Eyelid deflection is measured using induced current from a small magnet affixed to the eyelid. (B) When delivered to a trained animal, the co-terminating CS and US produce an anticipatory eyelid deflection (the conditioned response, CR) followed by a reflex blink evoked by the US. When the CS is delivered alone (blue trace), a bell-shaped CR is produced that peaks at the expected time of the US. The onset time is the time from the onset of the CS to a change in concavity of the eyeblink. The rise time is the amount of time between 10% and 90% of the maximum amplitude of the CR (10–90% rise). (C) Over twelve training sessions, the CR (portion of trace preceding US, indicated in red) develops in response to the US-CS pairing. One CS-alone response is shown as a blue trace. (D) Over four sessions of extinction training, the CR (red) disappears. After three sessions of reacquisition training, the CR (red) returns. Figure 1—source data 1 provides a wild-type benchmark for the eyeblink parameters described here, along with a statistical analysis of possible difference among wild-type cohorts (p > 0.05 in all instances). In order to separate the learning process from the learned response, we analyzed session-by-session sets of responses to distinguish the probability of generating a CS-evoked eyelid deflection from the amplitude of the eyelid deflection on trials when a response occurred (Garcia et al., 2003). To estimate the probability of generating a response, we used the overall distribution of eyelid movement amplitudes (Figure 2; Kehoe et al., 2008, 2009). First, we computed frequency histograms of the normalized eyelid movement amplitudes occurring between 100 ms and 250 ms after the CS onset (Figure 2A; for representative data, see Figure 2B, top). A peak in the histogram consistently occurred within the zero-amplitude bin (peak at amplitude of 0.006 ± 0.001, within the bin from −0.0125 to 0.0125), representing failure to respond to the stimulus with either closing or opening of the eyelid. We reflected the histogram of negative-amplitude responses across the zero axis and took the integral of the resulting distribution as the failure rate (Figure 2A, light gray). Response probability was defined as one minus the failure rate. The average response amplitude was calculated as the center of mass of the remaining distribution after subtracting the failure histogram (Figure 2A, black). Finally, in addition to probability and amplitude, we calculated three timing parameters of the average learned response: latency to onset of the blink, latency to peak, and rise time. Analysis of the full range of detectable responses allows the separation of response probability from response amplitude. (A) Response and non-response distributions from days 3 to 6 of training in a single animal. In the top panel for each day, gray bars show the distribution of non-responding trials. In the bottom panel, black bars show the remaining response distribution. The response probability is defined as the area under the response distribution. The average response amplitude is defined as the center of mass of the response distribution. The red line shows the fixed threshold at 0.15. (B) Representative data from a single wild-type animal. Top: scatterplot of individual response magnitudes for every trial over 12 sessions of training. Gray dots, individual non-responding trials. Black dots, responding trials. Middle: response probability for each session. Bottom, response amplitude for each session. To test whether variation in wild-type littermates might be a source of apparent differences in autism-model mouse eyeblink conditioning, we compared learning and timing parameters across all wild-type control groups (Figure 1—source data 1). We found no significant difference among wild-type cohorts in any learning parameter. In addition, we did not find statistically significant differences in time course of extinction or reacquisition. Because of the residual possibility of undetected variations (e.g., arising from a mixed background for the L7-Tsc1 cohort vs a C57B/6J background for all other groups) and changes in environmental conditions over the period of this study, we used wild-type littermates as a basis for comparison for each autism mutant group (Crawley, 2008). Three mouse models showed deficits in the response probability during training. In L7-Tsc1 mice (Figure 3A), heterozygous mutant mice (L7/Pcp2Cre::Tsc1flox/+or HET, n = 18) reached a response probability of 32.0 ± 4.3%, significantly lower than the 51.5 ± 3.5% level reached in control littermates (n = 16) (last four training sessions; unpaired two-sample t-test, p = 0.01; effect size, Cohen's d′ = 1.21). Furthermore, homozygous mutant mice (L7/Pcp2Cre::Tsc1flox/+ or MUT, n = 5) completely failed to acquire CRs (1.4% ± 0.7% in L7/Pcp2Cre::Tsc1flox/flox, n = 5; one-way analysis of variance test (ANOVA) across all groups, p < 0.0001, F(2,35) = 19.82, with Bonferroni post hoc statistical differences between L7/Pcp2Cre::Tsc1flox/flox and wild-type littermates, p = 3 × 10−9, Cohen's d′ = 3.01, and L7/Pcp2Cre::Tsc1flox/+ and wild-type littermates, p = 0.00002, d′ = 1.41). Further analysis of L7-Tsc1 mice focused on L7/Pcp2Cre::Tsc1flox/+ only. Probability defects are present in four mouse models. (A) Time course of response probability with acquisition training in L7-Tsc1 model mice. Black: WT. Red: L7/Pcp2Cre::Tsc1flox/+. (B) Time course of response probability with acquisition training in Cntnap2 model mice. Black: Cntnap2+/+. Red: Cntnap2−/−. Green: Cntnap2+/−. (C) Time course of response probability with acquisition training in Shank3ΔC. Black: Shank3+/+. Red: Shank3+/ΔC. (D) Time course of response probability with acquisition training in Mecp2R308. Black: WT. Red: Mecp2R308/Y. In panels (A) through (D), bar plots indicate response probability averaged over the last four training sessions. (E) Probability deficits across all groups. Dashed line: normalized wild-type littermate level. In all panels, shading and error bars indicate SEM, and * indicates p < 0.05. n ≥ 10 mice for each group. Figure 3—figure supplement 1 shows response probability in each group of animals during extinction and reacquisition. In Cntnap2 mice (Figure 3B), homozygous mutant mice (Cntnap2−/−, n = 12) reached a response probability of 35.1% ± 6.2%, significantly lower than the 57.2% ± 2.9% level reached in wild-type littermates (Cntnap2+/+, n = 13) (last four training sessions; Bonferroni post hoc test after one-way ANOVA, p = 0.007, d′ = 0.96). Notably, Cntnap2+/− mice, which show behavioral similarity to Cntnap2+/+ mice (Peñagarikano et al., 2011), were likewise statistically indistinguishable in learning or response amplitude from wild-type mice (n = 14 mice; Bonferroni post hoc tests after one-way ANOVA, p > 0.5). In Shank3ΔC mice (Figure 3C), the heterozygous mutant mice (Shank3+/ΔC, n = 17) reached a response probability of 55.9% ± 3.7%, lower than the 67.2% ± 2.2% reached in the wild-type littermates (Shank3+/+, n = 21) (unpaired two-sample t-test, p = 0.015, d′ = 1.10). In all three mouse models, probability deficits were present throughout training (two-way repeated measures ANOVA, main genotype effect; Cntnap2−/−: F(1,23) = 7.72, p = 0.01; L7/Pcp2Cre::Tsc1flox/flox: F(1,23) = 11.70, p = 0.002; Shank3+/ΔC: F(1,25) = 4.59, p = 0.04). One model did not show differences in learning probability or time course: Mecp2R308/Y heterozygotes (Figure 3D; 57.2% ± 2.9% WT vs 57.8% ± 3.6% Mecp2R308/Y, unpaired two-sample t-test, p = 0.9; two-way repeated measures ANOVA: main genotype effect, F(1,22) = 0.10, p = 0.7). We also applied our new analysis technique to a data set previously gathered by our group on the 15q duplication model mice (Piochon et al., 2014). We detected a significant difference in response probability that was consistent with previously observed impairment. Throughout acquisition training, response probability in patDp/+ mice (n = 10) was smaller than wild-type littermates (n = 11) (two-way repeated measures ANOVA: main genotype effect, F(1,19) = 19.84, p = 0.0003), culminating in a difference at the end of training (34.2% ± 2.9% patDp/+ vs, 49.2% ± 2.6% WT, unpaired two-sample t-test, p = 0.001, d′ = 1.46). In summary, the five models showed a gradient of defects in probability, ranging from L7/Pcp2Cre::Tsc1flox/flox (no learning) to Mecp2R308 heterozygotes (intact learning) (Figure 3E). To test whether learned blinks were disrupted, we measured their amplitude normalizing to an unconditioned reflex blink amplitude of 1. After 12 days of acquisition training, three mutant models showed deficits in response amplitude: L7/Pcp2Cre::Tsc1flox/+, Shank3+/ΔC, and Mecp2R308/Y. 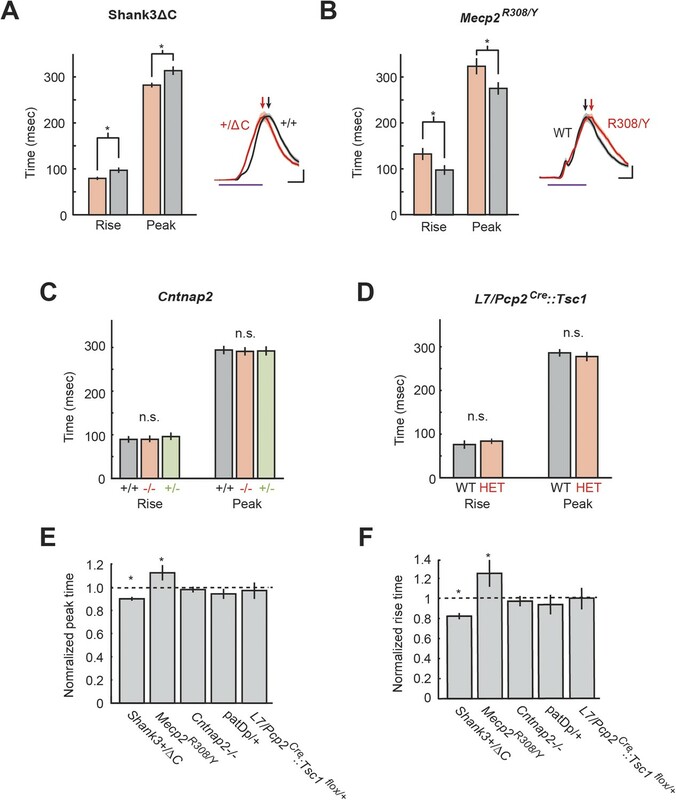 L7/Pcp2Cre::Tsc1flox/+ mice generated smaller-amplitude learned blinks throughout training (two-way repeated measures ANOVA: main genotype effect, F(1,23) = 7.71 p = 0.01) that culminated in a difference in amplitude at the end of training (last four training sessions: 0.28 ± 0.03 in L7/Pcp2Cre::Tsc1flox/+ vs 0.39 ± 0.05 in littermate controls, unpaired two-sample t-test, p = 0.02, d′ = 0.86) (Figure 4A, right). In Shank3ΔC mice (Figure 4C), response amplitude was similar to wild-type for most of training (main genotype effect, F(1,24) = 1.45, p = 0.2), but culminated in a small reduction by the end of training (0.31 ± 0.02 Shank3+/ΔC vs 0.36 ± 0.01 Shank3+/+, p = 0.03, d′ = 0.38). Mecp2R308/Y mice (Figure 4D; n = 11) showed consistently smaller learned responses throughout training (two-way repeated measures ANOVA: main genotype effect: F(1,22) = 12.72, p = 0.002), culminating in a difference in amplitude at the end of training (last four training sessions, 0.28 ± 0.02 Mecp2R308/Y in vs 0.44 ± 0.04 WT, unpaired two-sample t-test, p = 0.002, d′ = 1.11). CRs in Mecp2R308/Y mice also reached maximum amplitude much earlier in the training period (Figure 4D). Amplitude defects are present in three mouse models. (A) Time course of response probability with acquisition training in L7-Tsc1 model mice. Black: WT. Red: L7/Pcp2Cre::Tsc1flox/+. 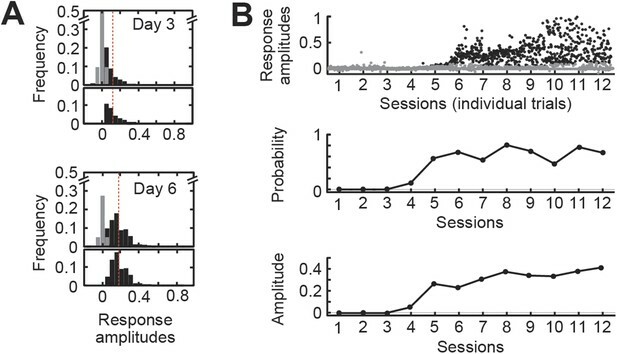 (B) Time course of response probability with acquisition training in Cntnap2 model mice. Black: Cntnap2+/+. Red: Cntnap2−/−. Green: Cntnap2+/−. (C) Time course of response probability with acquisition training in Shank3ΔC. Black: Shank3+/+. Red: Shank3+/ΔC. (D) Time course of response probability with acquisition training in Mecp2R308. Black: WT. Red: Mecp2R308/Y. In panels (A) through (D), bar plots indicate response probability averaged over the last four training sessions. (E) Probability deficits across all groups. Dashed line: normalized wild-type littermate level. In all panels, shading and error bars indicate SEM, and * indicates p < 0.05. n ≥ 10 mice for each group. We did not observe statistically significant differences in response amplitude or its development in Cntnap2 mice (two-way repeated measures ANOVA: main genotype effect, F(2,32) = 0.15, p = 0.85; 0.32 ± 0.03 Cntnap2−/− vs 0.34 ± 0.02 Cntnap2+/+, Bonferroni post hoc test after one-way ANOVA, p = 0.82) (Figure 4B, right) or in 15q duplication mice (two-way repeated measures ANOVA: main genotype effect, F(1,19) = 1.81, p = 0.2), including at the end of training (last four training sessions 0.31 ± 0.02 WT vs 0.27 ± 0.05 patDp/+, unpaired two-sample t-test, p = 0.4; also see Piochon et al., 2014). In summary, defects in blink amplitude ranged from large effects exceeding 1 standard deviation (Mecp2R308/Y) to no statistically detectable difference (Cntnap2−/− and patDp/+; Figure 4E). We asked whether CR extinction and savings, two learning processes that require prior eyeblink conditioning, were affected in these five mouse lines (Figure 3—figure supplement 1). After training, 4 days of extinction led to the near-disappearance of CRs in all autism model groups (CR percentage, day 12 acquisition vs day 4 extinction; paired t-tests, p < 0.05 for all comparisons) except for L7/Pcp2Cre::Tsc1flox/flox, which did not acquire CRs in the first place. The time courses of extinction were not statistically distinguishable between any autism model group and its corresponding wild-type littermates (p > 0.05 for all main genotype effects), indicating that perturbation of cerebellar cortex-dependent and other mechanisms that are necessary for initial eyeblink conditioning (Robleto et al., 2004) did not strongly affect overall extinction in the mouse models. In addition, the mouse models that initially acquired CRs also successfully reacquired CRs after 3 days of retraining (Figure 3—figure supplement 1B; paired t-tests of day 4 extinction vs day 3 reacquisition, p < 0.05 for all comparisons), with no appreciable difference in CR percentage between groups (p > 0.05 for all instances). The accelerated nature of this reacquisition, a process known as savings, is thought to depend in part on plasticity in the DCN (Medina et al., 2001; Ohyama et al., 2006). In short, learning deficits in the mouse models tested were specific to acquisition and were not observed in extinction or reacquisition. The cerebellum is thought to be critical for task timing, and both patients with cerebellar lesions and autism patients show disrupted timing in cerebellum-dependent tasks, including eyeblink conditioning. We therefore examined the timing of the CRs during unpaired CS trials, for which the entire response time course could be analyzed (Figure 5). Two groups of mice showed differences in timing: Shank3+/ΔC and Mecp2R308/Y. Learned responses produced by the Shank3+/ΔC mice began at the same time (onset latency: 148.7 ± 4.9 ms Shank3+/+, vs 144.6 ± 4.4 ms Shank3+/ΔC, p = 0.5), rose faster (rise time: 91.8 ± 0.5 ms Shank3+/+ vs 79.5 ± 0.3 ms Shank3+/ΔC, p = 0.04, d′ = 0.70), and peaked earlier (peak latency: 317.5 ± 9.0 ms Shank3+/+ vs 287.7 ± 5.8 ms Shank3+/ΔC, p = 0.03, d′ = 1.02) (Figure 5A, right) compared to wild-type littermates. In Mecp2R308/Y animals, learned responses began at the same time (onset latency: 120.9 ± 4.0 ms WT vs 117.7 ± 4.9 ms Mecp2R308/Y, p = 0.6), rose more slowly (rise time: 113.2 ± 12.4 ms WT vs 158.4 ± 15.6 ms Mecp2R308/Y, p = 0.04, d′ = 1.04), and peaked later (peak latency: 278.3 ± 14.9 ms WT vs 328.8 ± 16.4 ms Mecp2R308/Y, p = 0.04, d′ = 1.03) compared with wild-type littermates (Figure 5B, right). No alterations in onset latency, peak latency, or rise time could be detected in L7/Pcp2Cre::Tsc1flox/+ (Figure 5C), Cntnap2−/− mice (Figure 5D), or patDp/+ mice (Piochon et al., 2014) (p > 0.05 for all comparisons; summary of all mouse lines, Figure 5E,F). Timing defects are present in two mouse models. (A) Analysis of Mecp2R308/Y Mecp2R308 response timing (rise time and peak latency). Inset: representative eyelid movement traces. Purple line: CS duration. Scale bars: horizontal, 100 ms; vertical, 20% of unconditioned response (UR) amplitude. Arrowheads: peak times. (B) Analysis of Shank3ΔC response timing (rise duration and peak time). Inset: representative eyelid movement traces. Purple line: CS duration. Scale bars: horizontal, 100 ms; vertical, 20% of UR amplitude. Arrowheads: peak times. (C) Analysis of Cntnap2 response time (rise time and peak latency). (D) Analysis of L7-Tsc1 response time (rise time and peak latency) (E) Peak time deficits across all groups. (F) Rise time deficits. In plots (E) and (F), dashed lines indicate normalized wild-type littermate level. In all panels, shading and error bars indicate SEM, and * indicates p < 0.05. n ≥ 10 mice for each group. Autism has been suggested to be a general disorder of excessive sensory responsiveness, a concept known as the ‘intense world’ hypothesis (Markram and Markram, 2010). Potentially, our results in these mouse models could be accounted for by alterations in sensory responsiveness, a common feature of autism. To test this possibility, we measured responses to the US and to the pre-training CS. In US-only trials, we found no differences in unconditioned response (UR) latency measured from US onset (p ≥ 0.2 for unpaired comparisons for each cohort) or UR rise time (p ≥ 0.4 for unpaired two-sample comparisons for each cohort) (Table 1, ‘Unconditioned response’) and no differences in the correlation between UR velocity and UR magnitude (analysis of covariance group × peak interaction, p ≥ 0.2 for all cohorts). We detected no differences among wild-type cohorts for UR latency (one-way ANOVA, p = 0.5, F(4,64) = 0.92) or velocity (one-way ANOVA, p = 0.4, F(4,64) = 1.08). Unconditioned response was measured in terms of latency and rise time. Eyelid opening in response to initial CS trials was scaled to the size of the unconditioned response. Gait was measured as stride and stance (cm) for both forepaws and hindpaws. Swimming Y-maze acquisition was measured in terms of percentage of correct trials over valid trials for four acquisition periods and a test period. For all cells, top value (roman text) indicates the mutant mouse, while bottom value (italic text) indicates the control or wild-type littermates. All values mean ± SEM. All paired statistical comparisons yielded p-values greater than 0.05. As a second measure of sensory processing, on the first training day we observed robust eyelid opening in response to the light CS within 100 ms of CS onset (Table 1, ‘Eyelid opening’). Eyelid opening only occurred when animals had not yet begun to produce CRs, indicating that these responses were non-associative in nature. Eyelid opening occurred on a similar fraction of trials in all groups (p > 0.1 for unpaired comparisons between each autism model and wild-type littermates). Wild-type groups also did not differ detectably (one-way ANOVA, p = 0.9, F(4,64) = 0.22). In summary, sensory sensitivity was unaltered in any of the mouse models, and thus, deficits in delay eyeblink conditioning were not accompanied by upstream alterations in sensory sensitivity or downstream deficits in blink capability. Motor impairments are common in autism patients (Fournier et al., 2010), and cerebellar injury leads to both acute and long-lasting motor deficits. However, past investigations of our mouse models show mild or no motor impairments except for gait alterations in patDp/+ mice (Piochon et al., 2014). To extend these measurements, in three mouse models we analyzed gait, a motor function that can proceed without learning. We measured forepaw stance, forepaw stride, hindpaw stance, and hindpaw stride. We observed no differences between mutant and wild-type mice in Cntnap2−/− mice, L7/Pcp2Cre::Tsc1flox/+ mice, and Shank3+/ΔC mice (two-sample t-test, p > 0.05 for all comparisons; Table 1, ‘Gait analysis’). The L7/Pcp2Cre::Tsc1flox/+ result is consistent with previous reports (Tsai et al., 2012). Taken together with past research, our findings indicate that gross motor function in adult ASD mouse models is not a necessary consequence of disruption in cerebellum-dependent learning. Mouse models of autism have been shown to be impaired in fear conditioning and hippocampus-dependent reversal (Crawley, 2008; Silverman et al., 2010). To test a second, non-cerebellar form of learning, we subjected three of our models to initial acquisition of a water Y-maze. After four training sessions, we did not observe any statistically detectable difference in the ability to find the platform in Cntnap2−/− mice, L7/Pcp2Cre::Tsc1flox/+ mice, or Shank3+/ΔC mice (two-sample t-test, p > 0.05 for all comparisons; Table 1, ‘Swimming Y-maze acquisition’). The L7/Pcp2Cre::Tsc1flox/+ finding is consistent with previous reports of normal T-maze acquisition (Tsai et al., 2012). Therefore, the eyeblink-conditioning deficits we have observed do not reflect a broad impairment in learning mechanisms. Since eyeblink conditioning depends on the cerebellum, we searched for gross anatomical and cell morphological defects in the cerebella of our mouse models. Using histological methods, in Shank3+/ΔC, Cntnap2−/−, Mecp2R308/Y, and patDp/+ mice, we found no differences between mutant mice and wild-type littermates in PC density, anterior or posterior granule layer thickness, and anterior or posterior molecular layer thickness (p > 0.1, all comparisons). In L7/Pcp2Cre::Tsc1flox/+ mice, for which alterations in PC density have been previously reported (Tsai et al., 2012), we found no difference for anterior or posterior granule layer thickness and molecular layer thickness for L7/Pcp2Cre::Tsc1flox/+ (p > 0.1, all comparisons). In summary, with the exception of L7/Pcp2Cre::Tsc1flox/+ mice, these mouse lines do not show gross alterations in granule or PC density. PC arbors are shaped by the cumulative effects of granule cell (GrC) input (Joo et al., 2014), and therefore, would be potentially altered in their form. We used Sholl analysis to examine the morphology of PC dendritic arbors in Shank3+/ΔC, Cntnap2−/−, Mecp2R308/Y, patDp/+, and L7/Pcp2Cre::Tsc1flox/+ mice. Only Shank3+/ΔC mice differed from wild type, showing higher complexity of distal dendrites (two-way repeated measures ANOVA, main genotype effect, F(1,39) = 3.50, p = 0.07), with a significant distance × genotype interaction (F(16,624) = 2.77, p = 0.0002; Figure 6A). Further analysis of Shank3+/ΔC mice revealed that compared with wild type, the center of mass of the Sholl distribution was farther from the soma (p = 0.03) and had a greater total number of crossings at distances farther than 96 μm from the soma (p = 0.01). Purkinje cell dendritic arbors show structural defects in Shank3+/ΔC and Mecp2R308/Y mice. (A) Purkinje cell (PC) dendrite arborization defect is present in Shank3+/ΔC. Left: Sholl analysis example for Shank3+/ΔC. Right: groupwise Sholl analysis for Shank3+/ΔC. Sholl analysis for other four mouse models did not show similar arborization defects, as shown in Figure 6—figure supplement 1. (B) Spine density defects are present in Shank3+/ΔC and Mecp2R308/Y. Left: example image of Shank3+/+ dendritic arbor. Right: spine density for Shank3+/ΔC and Mecp2R308/Y groups. In all panels, shading and error bars indicate SEM, n.s. indicates p > 0.05, and * indicates p < 0.05. n ≥ 12 cells for each group. Closer examination of PC arbors (Figure 6B) revealed a decrease in the number of visible spines per 10 μm on distal dendrites of Shank3+/ΔC mice (p = 0.04) and Mecp2R308/Y mice (p < 0.0001). The remaining three models showed no differences in either PC arbors or spine density (Figure 6B, Figure 6—figure supplement 1; p > 0.3 for main group effect and p > 0.5 for space × genotype interactions for all comparisons; p > 0.4 for all pairwise comparisons of spine density). In summary, differences in dendritic morphology were found specifically in Shank3+/ΔC and Mecp2R308/Y mice, consistent with alterations in GrC input and/or PC dendritic growth mechanisms. Our principal finding is that five mouse models of ASD show deficits in delay eyeblink conditioning, a learning task that requires the cerebellum (Figure 7A). The five models tested showed three major categories of deficit (Figure 7B): in the process of acquiring the CR, in the amplitude of the CR, and in the timing of the CR. Taken together, these findings paint a behaviorally based picture of how diverse ASD-related genetic conditions affect a single learning process. Together with mouse studies of neuroligin-3 (Baudouin et al., 2012) and Fragile X mental retardation 1 (Koekkoek et al., 2005) and a valproate rat model of autism (Stanton et al., 2007; Murawski et al., 2009), our work brings to eight the number of autism rodent models with alterations in cerebellum-dependent function. Cerebellar learning and performance deficits co-vary with circuit-specific gene expression patterns. (A) The first four data columns show perturbations in learning (green shading) and performance (yellow shading). The last three columns show combined gene expression (Figure 1) and morphological (Figure 5) perturbations for the olivocerebellar (red shading) and granule cell layer (blue shading) pathways, along with extracerebellar (dark gray) pathways. Note that Cntnap2+/−, which has been reported to be not behaviorally different from Cntnap2+/+ (Peñagarikano et al., 2011), is shown for reference. Table 2 is an expanded tables of the phenotypes described here. (B) Response amplitude and probability in transgenic mice (open circles) normalized to wild-type littermate (‘WT’) means for all models. Dark gray shading indicates mutants for which there were also timing defects. Error bars indicate SEM. (C) The canonical cerebellar circuit. Input along the CS (turquoise) pathway via mossy fibers (mf) from the pontine nuclei enters the cerebellar cortex through granule cells (GrC), which receive feedforward and feedback inhibition from Golgi cells (GoC) in the granule cell layer. GrCs send parallel fiber (pf) projections to PC dendritic arbors. PCs also receive teaching signals along the US (gray) pathway via climbing fibers (cfs) from the inferior olive. The output of clustered PCs (gray) converges onto neurons in the deep cerebellar nuclei (DCN), which drive downstream neurons in the output pathway. Delay eyeblink conditioning is a more precise assay of cerebellar function than two phenotypes that are commonly assumed to measure cerebellar function, rotarod and gait. Rotarod and gait can reveal malfunction in a wide range of brain structures, including cerebellum (Thach and Bastian, 2004), striatum (Rothwell et al., 2014), and basal ganglia (Takakusaki et al., 2008). In contrast, delay eyeblink conditioning (as well as another form of learning, vestibulo-ocular reflex gain modulation) has well-mapped relationships to cerebellum and brainstem circuitry (Raymond et al., 1996; Boele et al., 2010). Our findings suggest specific cerebellar circuit elements that can be investigated further, either in non-human animals or in autistic patients. Our conditioning experiments quantified dysfunction in two tasks for which the cerebellum is well-suited: associative learning between multiple senses and the detection of fine timing differences. Two pathways—the olivocerebellar loop (Figure 7C, red pathway) and the GrC layer input pathway (Figure 7C, blue pathway)—play key roles in the acquisition of learned eyeblink responses in mammals (McCormick and Thompson, 1984; Yeo and Hesslow, 1998; Garcia et al., 1999; Attwell et al., 2001; Longley and Yeo, 2014), including mice (Koekkoek et al., 2003). Information about the aversive US is conveyed through the olivocerebellar loop, consisting of PCs in the cerebellar cortex, the inferior olive, and the DCN (Figure 7C, red pathway). This information instructs plasticity in the mossy fiber (mf)—GrC—PC pathway, which conveys incoming CS information. The GrC layer pathway undergoes multiple forms of plasticity, including parallel fiber (PF)-PC long-term depression (Hansel et al., 2001; Carey and Lisberger, 2002; Gao et al., 2012), and after training. PC output helps to drive a well-timed and well-formed CR (Choi and Moore, 2003) and drive late-stage plasticity in the DCN (Zheng and Raman, 2010). Thus, defects in the reliable learning and production of CRs might be interpreted as disruption of the olivocerebellar ‘instruction’ system (Garcia et al., 1999) or the granule cell layer ‘representation’ system (Arenz et al., 2009). Activity in the GrC network, which receives direct mf input, is thought to represent key temporal components to drive a well-timed response (Medina and Mauk, 2000; D'Angelo and De Zeeuw, 2009). Because PC sodium-based simple-spike output acts as an approximately linear readout of synaptic drive (Walter and Khodakhah, 2006), the time course of CR production might be expected to be constructed from summed patterns of activity in specific combinations of GrCs and inhibitory neurons. Therefore, defects in response timing and amplitude might be interpreted as disruption of synaptic transmission and/or plasticity in the MF pathway. Four mouse models showed decreases in the CR probability: L7-Tsc1 (L7/Pcp2Cre::Tsc1flox/+ and L7/Pcp2Cre::Tsc1flox/flox), patDp/+, Cntnap2−/−, and Shank3+/ΔC. Upon investigating patterns of gene expression, we found that the disrupted genes in three models (L7-Tsc1, patDp/+, and Cntnap2−/−) are expressed in PCs, inferior olive, and/or DCN (Figure 7A, light green and red [regular case], respectively; Figure 7C, red). In L7/Pcp2Cre::Tsc1flox/+ mice, which are PC-specific, early-life loss of Tsc1 leads to increased spine density and decreased excitability in PCs (Tsai et al., 2012). This decreased excitability can affect learning by interfering with climbing fiber (cf)-based instruction, either by reducing PC dendritic excitability or by making the cerebellar cortex less effective at influencing the DCN, resulting in inhibited IO responsiveness to the US (Schonewille et al., 2010). Reduced PC firing would also be expected to reduce response amplitudes, which we have observed. Similarly, patDp/+ mice show cf structural plasticity during development and deregulated PF-PC LTD in adults (Piochon et al., 2014), echoing findings in other models (Koekkoek et al., 2005; Baudouin et al., 2012). It should be noted that other forms of cerebellar plasticity can contribute to learning in the absence of PF-PC LTD (Schonewille et al., 2011). 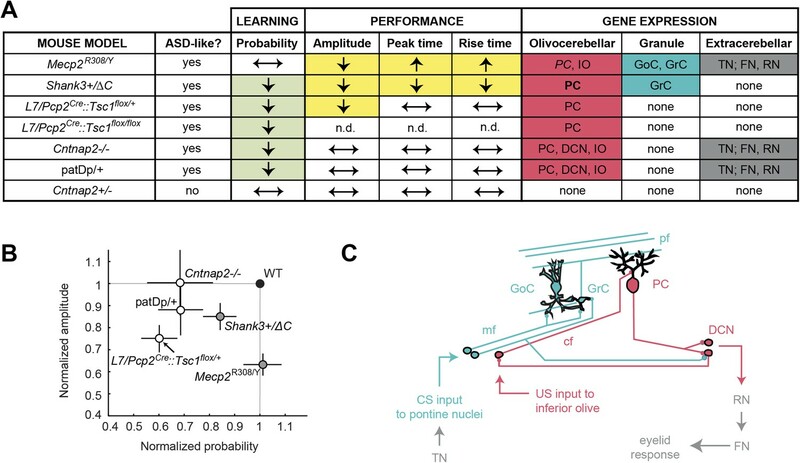 Taken together, the evidence suggests that cerebellar learning defects in autism mouse models may be strongly shaped by reduced function in the olivocerebellar circuit and associated synaptic plasticity mechanisms. The fourth model that showed a probability defect was Shank3+/ΔC. Shank3 is expressed specifically at postsynaptic densities in the granule cell layer in the mouse cerebellum (Tu et al., 1999; Böckers et al., 2004, 2005). We observed increased elaboration of the distal dendrites along with decreased spine density (Figure 6; Figure 7A, light green and red cells [bold case]). Neurotrophin-3 (NT-3) from GrCs is required for PC dendritic morphogenesis (Joo et al., 2014), suggesting the possibility that the Shank3+/ΔC mutation may disrupt PC dendritic function. We observed both amplitude and timing defects in two mouse models (Figure 7B, gray circles), Shank3+/ΔC and Mecp2R308/Y. These genes are expressed in GrCs (Figure 7A, yellow and turquoise cells, respectively), and Mecp2 is also expressed in Golgi cells (GoCs). Shank3 encodes a scaffolding protein that may influence MF-GrC and GrC-PC synaptic function by reducing glutamatergic transmission and plasticity (e.g., Peça et al., 2011; Yang et al., 2012; Kouser et al., 2013), thus, impairing cerebellar learning (Giza et al., 2010; Andreescu et al., 2011). Likewise, Mecp2 expression is dramatically upregulated in GrCs after P21, a time when MF-GrC and PF-PC synapses are formed and still maturing (Altman, 1972), suggesting that Mecp2 plays a role in MF-GrC synapse function (Mullaney et al., 2004) and glutamatergic synaptic transmission and plasticity (Moretti et al., 2006). It is notable that despite the fact that Mecp2 is also expressed in PCs (Mullaney et al., 2004), Mecp2R308/Y mice showed no defect in probability of learning. We chose these mice for their relatively weak motor dysfunction so that we could characterize eyeblink-conditioning deficits in detail. Other Mecp2 mutants might show more of a probability phenotype. In addition to specific cerebellar substrates, delay eyeblink conditioning also depends on processing outside the cerebellum (Boele et al., 2010; Figure 7A, dark gray cells; Figure 7C, dark gray arrows). Several genes in our mouse models (though not Shank3) are likely to be expressed in trigeminal nucleus, which transmits sensory information to the pons and mf pathway, as well as the red nucleus and facial nucleus, which ultimately drive the production of the eyeblink (Figure 7A, dark gray cells; Figure 7C, dark gray arrows; Figure 7—figure supplement 1). The acquisition of delay eyeblink conditioning may also be modulated by the amygdala and hippocampus (Lee and Kim et al., 2004; Boele et al., 2010; Sakamoto and Endo, 2010; Taub and Mintz, 2010), but we did not detect two known consequences of such modulation, learning during the first training session and short-latency alpha responses to the CS. Past investigations of autism (Sears et al., 1994; Oristaglio et al., 2013) and Fragile X syndrome (Koekkoek et al., 2005; Tobia and Woodruff-Pak, 2009) have reported the percentage of CS-responses that exceed a fixed threshold (‘% CRs’), as well as CR size averaged across all trials. However, these measures conflate changes in the probability of learning with changes in the amplitude of learned responses. For example, a study that examined de novo (i.e., no previous conditioning) delay eyeblink conditioning (Sears et al., 1994) found that in high-functioning (average IQ > 100) autistics, the %CR fraction rose more rapidly than in controls, reaching close to a half-maximum after only two blocks of trials. In the direction of loss-of-function, impairments in delay eyeblink conditioning have been observed in Fragile X patients (Koekkoek et al., 2005; Tobia and Woodruff-Pak, 2009); in this case, PC-specific knockout of the Fragile X protein Fmr1 in mice was sufficient to cause eyeblink-conditioning defects, suggesting that learning was specifically perturbed. For comparison with the work reported here, future human eyeblink-conditioning studies would have to distinguish changes in learning from changes in response amplitude. A second promising domain for investigations of ASD patients is eyeblink response kinetics. Variations in response kinetics may depend on the specific genetic background. In idiopathic autism (Sears et al., 1994), CRs came approximately 50 ms earlier, as measured using both the time to CR onset and the time to CR peak. Similarly, after two sessions of trace conditioning (Oristaglio et al., 2013), delay conditioning initially leads to a decrease in response onset and latency of approximately 50 ms, followed by a convergence toward normal performance as training continues. In contrast, Fragile X patients show no differences in timing in early training sessions (Koekkoek et al., 2005; Tobia and Woodruff-Pak, 2009), but after average CR amplitude reaches a plateau, the peak latency to CR decreases by approximately 30 ms (Tobia and Woodruff-Pak, 2009). Changes of 30–50 ms are comparable in size to the effects we have observed in mice with granule cell pathway perturbation. In addition, in a valproate-based rat model of autism (Arndt et al., 2005), prematurely timed eyeblink responses were found for long interstimulus intervals (Murawski et al., 2009). In summary, past findings suggest that perturbation of cerebellar granule cell layer activation may be common in both idiopathic and syndromic autism. The general observation of shortened latency is consistent with our findings in Shank3+/ΔC mice, suggesting this line as a model for the timing deficits observed in autistic persons. Finally, although past measurements have been done in older children post-diagnosis, eyeblink conditioning can be assayed in subjects as young as 5 months of age (Claflin et al., 2002). The possibility of early testing suggests that delay eyeblink conditioning could be a biomarker (Reeb-Sutherland and Fox, 2015) for identifying pre-diagnosis perturbations in cerebellum-dependent learning. Eyeblink-conditioning defects appear more often in mouse autism models than other non-autism-like phenotypes (Table 2). This specific dissociation (i.e., the absence of correlation with non-cerebellar phenotypes) suggests that cerebellar plasticity and autism's cognitive deficits might be related in some specific manner. The cerebellum arises repeatedly in the study of autism (Wang et al., 2014). In an analysis of gene–phenotype associations (Meehan et al., 2011), autism-related genes were found to be associated with a cluster of phenotypes that included social defects, abnormal motor behavior, and cerebellar foliation. A number of ASD genes are co-expressed in the cerebellum (Menashe et al., 2013), and ASD patients show differences in many cerebellar cell types (Bauman and Kemper, 1985; Fatemi et al., 2002; Whitney et al., 2008; Wegiel, et al., 2010) as well as gross cerebellar structure, starting at an early age (Hashimoto et al., 1995; Abell et al., 1999; Stanfield et al., 2008; Courchesne et al., 2011). Therefore, ASD genes are highly likely to shape cerebellar circuit function. Effects on cerebellar function could even have downstream consequences for function of distal brain regions of known cognitive significance to which the cerebellum supplies information (Wang et al., 2014). Social, downward arrows indicate reduced performance on three-chamber preference test of mouse vs object, interactions with novel mouse, or play behavior. Ultrasonic vocalizations (USV) are used as an assay of communicative behavior. Ultrasonic, downward arrows indicate longer latency or fewer calls (adult), or more distress calls or longer latency to first call by pups. Repetitive or perseverative behaviors are assayed by grooming and flexibility on maze tasks. Eyeblink learning, downward arrows indicate a decrease in response probability. Eyeblink amplitude, downward arrows indicate a decrease in response amplitude. Eyeblink timing, downward arrows indicate earlier shifts in peak latency and decrease in rise time, while upward arrows indicate later shifts in peak latency and increase in rise time. Maze flexibility, downward arrows indicate impairment on T-maze alternation or reversal or flexibility on a Morris water or Barnes maze. Gross motor functions are assayed by rotarod and gait tasks. Rotarod, table entries indicate differences in the time to fall from an accelerating rotarod. Gait, table entries indicate differences in stance or stride parameters. Maze acquisition, downward arrow indicates impairment of acquisition on Morris water maze, Barnes maze, walking T-maze, or swimming T-maze. Anxiety, up arrows indicate increased freezing and closed-arm preference in elevated plus maze, increased light–dark preference, or decreased open-field behavior. Unless otherwise specified, the downward arrow indicates a significant decrease relative to wild-type, the upward arrow indicates a significant increase relative to wild-type, the horizontal arrow indicates no significant difference relative to wild-type, and ‘nd’ indicates unknown. The ‘*’ in row 5 indicates a difference lacking statistical significance. References: [a] Kouser et al., 2011; [b] Peñagarikano et al., 2011; [c] Shahbazian et al., 2002a; [d] Moretti et al., 2006; [e] De Filippis et al., 2010; [f] Tsai et al., 2012; [g] Nakatani et al., 2009; [h] Tamada et al., 2010; [i] Piochon et al., 2014. However, our results must also be reconciled with a recent study that started not from ASD genes, but from specific perturbations to cerebellar function (Galliano et al., 2013). That work revealed little effect on a variety of standard non-motor tasks, including social, navigational, and memory tasks. Those tasks differ from current tests of autism model face validity. For example, the social assay involved consecutive presentation of mouse/object stimuli, as opposed to the simultaneous choice that occurs in the three-chamber test (Yang et al., 2011). Likewise, no test was given for perseveration such as maze reversal or grooming duration (Tsai et al., 2012). We suggest that rigorous evaluation of cerebellar involvement in non-motor function will require tasks of greater difficulty and complexity than past practice. We have shown that mouse autism models have difficulty in a cerebellum-dependent form of associating sensory stimuli that are spaced closely in time. The integration of closely timed events across sensory modalities could be critical for statistical learning. Statistical learning can encompass the association of an auditory or visual stimulus to predict some other event, a capacity that is likely to be at the core of the acquisition of language (Ferguson and Lew-Williams, 2014) and other cognitive capacities (Dinstein et al., 2012). Such learning is commonly assumed to require neocortical plasticity via Hebbian uninstructed learning. In addition, statistical learning from unexpected events is also efficiently supported by instructed plasticity (Courville et al., 2006), a phenomenon for which cerebellar circuit architecture is well-suited (Marr, 1969). Since the neocortex and cerebellum communicate with one another bidirectionally, these two brain systems might play complementary roles in learning from experience. Projections to forebrain are present in early postnatal life (Diamond, 2000), and early childhood disruption of the cerebellum affects the development of social cognition and language (Riva and Giorgi, 2000; Steinlin, 2008; Bolduc et al., 2012). In this context, eyeblink conditioning is an example of learning from the close timing of two events of different sensory modality, and defects in it may reflect broader difficulties in subsecond temporal sensory association. If such difficulties are present in early stages of autism, the cerebellum may be a potential target for early-life therapeutic intervention. Cntnap2 mice were bred at Princeton University on a heterozygote–heterozygote strategy using breeding pairs obtained from the Geschwind laboratory at the University of California, Los Angeles (Peñagarikano et al., 2011). These animals were originally generated by the Peles laboratory (Weizmann Institute of Science, Israel) through the replacement of the first exon of Caspr2 (Cntnap2) using gene-targeting techniques in mice with the imprinting control region (ICR) background (Poliak et al., 2003). The mice were then outbred on the C57BL/6J background for at least 10 generations and characterized behaviorally (Peñagarikano et al., 2011). For behavioral experiments, 39 animals from 17 litters were used. Shank3+/ΔC mice were bred at Princeton University on a heterozygote–heterozygote strategy using breeding pairs acquired from the Worley laboratory at Johns Hopkins University. These mice were generated by the conditional deletion of exon 21 of Shank3 to excise its C-terminal domain, including the Homer-binding domain (Kouser et al., 2013; http://jaxmice.jax.org/strain/018389.html). The mice were generated on a mixed background and backcrossed on a C57BL/6J background for at least five generations. Only heterozygotes of the C-terminal mutation were used (Durand et al., 2007). For behavioral experiments, 38 animals from 16 litters were used. 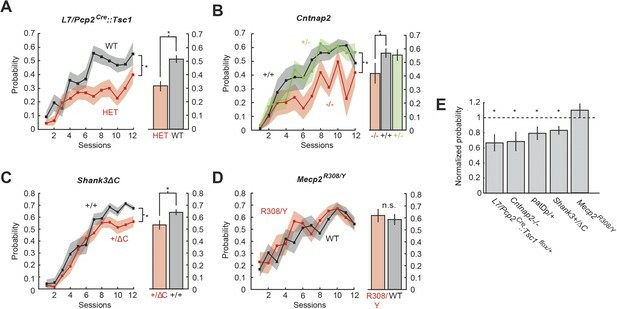 Mecp2R308/Y mice were bred at Princeton University on a heterozygote-wild-type strategy using a breeding pair acquired from Jackson Laboratories (B6.129S-Mecp2tm1Hzo/J, stock no. : 005439). Mice on the 129/SvEv background have a truncating mutation of Mecp2 introduced through the insertion of a premature stop after codon 308 (Shahbazian et al., 2002a). These mice were backcrossed on the C57BL/6J background for at least 10–12 generations. Because these mice show a regressive phenotype, they were tested at 16–20 weeks, an age at which the mice begin showing cognitive symptoms and minor motor dysfunction (‘early symptomatic’ to symptomatic phase: Shahbazian et al., 2002a; Moretti et al., 2006; De Filippis et al., 2010). For behavioral experiments, 28 animals from 11 litters were used. The Tsc1 mice were bred at Princeton University from breeding pairs on a mixed (C57BL/gJj, 129 SvJae, BALB/cJ) background acquired from the Sahin laboratory at Boston Children's Hospital, Harvard Medical School (Tsai et al., 2012). These mice were originally generated by crossing L7/Pcp2-Cre mice with Tsc1flox/flox mice (Tsai et al., 2012). For the present study, the offspring of this cross were crossed to produce the L7/Pcp2Cre::Tsc1flox/+ (heterozygous) and L7/Pcp2Cre::Tsc1flox/flox (homozygous) animals. Littermate controls were pooled from Tsc1+/+ (pure wild-type), Tsc1flox/+, L7Cre;Tsc1+/+ (L7Cre), and Tsc1flox/flox (flox) mice. For behavioral experiments, 34 animals from 18 litters were used. patDp/+ (15q11-13 duplication) mice were acquired from the Hansel laboratory at the University of Chicago and the Takumi laboratory at Hiroshima University and tested as previously reported (Nakatani et al., 2009; Piochon et al., 2014). Data from the eyeblink conditioning experiments described in Piochon et al. (2014) are available upon request from the corresponding author. For all experiments, we used 2- to 4-month-old males with matched littermates unless otherwise indicated. To ensure that the ages of the mice did not affect the results, we corrected our statistical tests of average CR performance, response probability, and response amplitude across sessions 9–12 and the CR timing parameters, using analysis of covariance tests with age (days) as a covariant with post hoc Tukey's tests (Piochon et al., 2014). This analysis produced no changes in statistical significance of the findings reported throughout this paper (Tukey's test, p > 0.05 in all instances). Mice were group-housed (at ≥ 8 weeks of age) and maintained on a 12-hr reverse light–dark cycle with ad libitum access to food and water. All experiments were performed according to protocols approved by the Princeton University Institutional Animal Care and Use Committee. Each mouse was head-fixed above a stationary, freely rotating foam wheel, which allowed it to locomote throughout the experiment (Figure 2A). In this position, the US (airpuff) could be delivered from a consistently to the eye through a blunted 27-gage needle. The eyelid deflection was detected using a Hall effect sensor (AA004-00, NVE Corporation, Eden Prairie, MN) that was mounted above the same eye (Koekkoek et al., 2002). Prior to placement in the experimental apparatus, each mouse was briefly anesthetized with isoflurane and a small neodymium magnet (3 mm × 1 mm × 1 mm, chrome, item N50, Supermagnetman, Birmingham, AL) was attached to the lower eyelid with cyanoacrylate glue (Krazy Glue, Westerville, OH). The sensor provided a readout of eyelid position by linearly converting a change in magnetic field due to the displacement of the magnet relative to the sensor a change in voltage. The CS (ultraviolet LED) was also delivered to the ipsilateral eye. The animals were allowed to habituate to this apparatus for at least 195 min over 3–5 days. Following habituation, acquisition training took place over 12 training sessions (1 session/day, 6 days/week), during which the animals received 22 blocks of 10 trials each. CSs (ultraviolet light, 280 ms) were paired with an aversive US (airpuff delivered by a blunted needle to the cornea, 30–40 psi, 30 ms, co-terminating with the CS). Ultraviolet light is in the sensitive range of laboratory mice (Jacobs et al., 2001). Each block contained 9 paired US-CS trials and 1 unpaired CS trial, arranged pseudorandomly within the block (Figure 2B). Each trial was separated by an interval of at least 12 s (see below). Following acquisition training, the mice received extinction and reacquisition training. Extinction training took place over 4 sessions (1 session/day) consisting of 22 blocks of 10 trials each. Each block contained five unpaired CS trials and five unpaired US trials, arranged pseudorandomly within the block. Reacquisition training took place over 3 sessions, and the animals received the same training sequence as in acquisition training. Trials were triggered automatically using a custom MATLAB (Mathworks, Natick, MA) graphical user interface. Stimuli were triggered by Master-8 (AMPI, Inc., Jerusalem, Israel) via the data acquisition system (National Instruments, Austin, TX). (Scripts for data collection and analysis along with sample data are available at https://github.com/akloth0325/eyeblink-conditioning.) The Master-8 controlled the stimulus timing and sent square signals to an ultraviolet LED and a Toohey Pressure System IIe spritzer (Toohey Co., Fairfield, NJ) to generate the CS and US, respectively. The output from the Master-8 was returned to the data acquisition system. The voltage output of the Hall-effect sensor was filtered and amplified (band-pass filtered from 0.01 Hz to 4 kHz, gain adjusted to signal quality) and sent to the data acquisition system. The beginning of an individual trial was subject to the following criteria. First, at least 12 s must have elapsed since the last trial. Time was added to the interval between any two consecutive trials according to the stability of the eyelid position signal: if the eyelid position signal (the ‘baseline’ signal) strayed outside an experimenter-determined range during 1 s prior to the planned delivery of the CS, an additional 1 s was added to the intertrial interval until this criterion was met, after which the trial was initiated. The experimenter used the voltage range of UR (baseline to peak) during 3–12 unpaired US trials delivered at the beginning of the session to determine an acceptable voltage range for baseline activity prior to the beginning of each trial; typically, this range was ±10% of the average size of the UR. The data from each trial were normalized prior to analysis. For the paired US-CS trials, the eyelid position was normalized to the range between the baseline and the peak amplitude of the UR during the trial. For the unpaired CS trials, the eyelid position was normalized to the range between the baseline and the UR peak for the most recent US-CS trial. Then, the response probability and response amplitude for a single training session were calculated. This normalization scheme yielded results that were not significantly different from those acquired by normalizing to a sessionwide average UR (paired t-tests within groups for CR performance, response probability, and response amplitude on session 12, p > 0.05 in all instances). As sensory and motor tests, motor function was analyzed using unpaired US trials from the first session of training. Peak time, rise time, and onset time were calculated on smoothed individual traces as described above, within 75 ms of US onset. Photic eyelid opening was analyzed during the first session of eyeblink conditioning, during which no conditioned eyeblink was generated. Using the normalized individual eyelid deflection traces, deflections that were more than 5% below the baseline 70–250 ms after the CS onset—but not before—were counted. Mice underwent one session of habituation training (1 day), four sessions of acquisition training (the next day), and two sessions of testing (the following day) in a water Y-maze (custom made: 32 cm arms positioned at 120° from one another, made of semitransparent polycarbonate) filled with opaque water (non-toxic white tempera paint was added to achieve opacity). On the habituation day, mice were dropped into 10 cm of water in order to measure their swimming ability. The habituation day consisted of three 60-s trials, each trial starting from one arm of the maze. No platform was hidden beneath the surface of the water during this phase of training. During acquisition, the mice were randomly sorted into leftward-going or rightward-groups; this selection determined in which arm the platform would be hidden beneath the surface of the opaque water for each mouse. For five trials per training session, the mice were dropped into the arm closest to the experimenter and were given 40 s to find the platform. On the following day, the animals underwent two more sessions of the same protocol to test memory. The swimming trajectories of the mice were captured on video and were processed by a custom Python script (available at https://github.com/bensondaled/three-chamber) to determine whether the animal found the platform on a given trial. Excursions to the wrong arm of the maze were counted as incorrect. Results were reported the fraction of correct trials to valid trials, where valid trials included all trials on which the animal successfully to swam to either the left or the right arms of the Y-maze. Mice videotaped during two runs along a 100-cm track over a plexiglass surface. Each run was initiated with an airpuff to the hindlimb. Runs were videotaped (iPhone 6, 40 frames/s) from below, and light was sourced from below. After being separated using a custom MATLAB scripts, JPEG stacks were analyzed using FIJI Manual Tracker (LOCI, Madison, WI) for the centroid of each paw. Stance and stride parameters were calculated from four paw centroid trajectories (≥10 strides per run) for each animal. Mice were fitted with a 1′′ × ½′′ × 1/32′′ custom titanium headplate (Ozden et al., 2012; Heiney et al., 2014). During the surgery, each mouse was anesthetized with isoflurane (1–2% in oxygen, 1 l/min, for 15–25 min) and mounted in a stereotaxic head holder (David Kopf Instruments, Tujunga, CA). The scalp was shaved and cleaned, and an incision was made down the midline of the scalp. The skull was cleaned and the scalp margin was kept open with cyanoacrylate glue (Krazy Glue). The center of the headplate was positioned over bregma and attached to the skull with quick-drying dental cement (Metabond, Parkell, Edgewood, NY). Following the surgery, the mice received a non-steroidal anti-inflammatory drug (0.1 ml, 50 mg/ml Rimadyl [carprofen, Zoetis, Florham Park, NJ]) subcutaneously and were allowed to recover for at least 24 hr. Tissue from separate groups of mice for each cohort was used to analyze the morphology of the cerebellum. For Nissl staining and immunohistochemistry, the mice were anesthetized with 0.15 ml ketamine-xylazine (0.12 ml 100 mg/ml ketamine and 0.80 ml mg/ml xylazine diluted 5× in saline) and transcardially perfused with 4% formalin in Delbucco's phosphate buffered saline (PBS). The brain was extracted and stored at 4°C in 4% formalin in PBS overnight. Then, the brains were split into hemispheres. The hemispheres used for Nissl staining were stored in 0.1% sodium azide in PBS at 4°C until vibratome sectioning. The hemispheres used for immunohistochemistry were prepared for cryosection. These hemispheres were stored in 10% sucrose in PBS at 4°C overnight and were blocked in a solution of 11% gelatin/10% sucrose. The block was immersed in a mixture of 30% sucrose/10% formalin in PBS for 2 hr and then stored in 10% sucrose in PBS at 4°C for up to 2 weeks. For Golgi-Cox staining, the mice were anesthetized with 0.15 ml ketamine-xylazine (0.12 ml of 100 mg/ml ketamine and 0.80 ml mg/ml xylazine diluted 5× in saline) and decapitated immediately. The brain was removed quickly in ice-cold PBS and processed using the FD Rapid GolgiStain kit (FD Neurotechnologies, Inc., Columbia, MD), according to the kit instructions. Brain hemispheres used for Nissl staining were blocked sectioned sagittally on a vibratome at a thickness of 70 µm. The sections were mounted on Fisherbrand SuperFrost microscope slides (Thermo Fisher Scientific, Waltham, MA) and allowed to dry at room temperature overnight. Then, they were Nissl stained with cresyl violet according to standard procedures and coverslipped with Permount (Thermo Fisher Scientific, Waltham, MA). The sections were imaged at 5× magnification and ‘virtual slices’ were constructed from serial images captured by the MicroBrightField software Stereo Investigator (MBF Biosciences, Williston, VT). The thicknesses of the molecular layer and the granule layer were measured on anterior and posterior portions of vermal sections of the cerebellum at 150-µm intervals using ImageJ (National Institutes of Health, Bethesda, MD). Brains used for Golgi-Cox staining were sectioned sagittally on a vibratome at a thickness of 120 μm. The sections were mounted on slides and allowed to dry in the dark at room temperature overnight. Then, they were processed for Golgi staining according to the instructions for the FD Rapid GolgiStain kit and coverslipped with Permount. The sections were imaged at 20× and 40× and images of Golgi-stained PCs and captured by the MicroBrightField software Stereo Investigator. The cross-sectional area of the soma and the maximum height, maximum width, and the cross-sectional area of the PC dendritic arbor were measured using ImageJ. In addition, the complexity of the PC dendritic arbor was determined using Sholl analysis (Sholl, 1956) using ImageJ; briefly, the number of intersections of the dendritic arbor with concentric circles drawn at 12-μm intervals from the soma was counted (e.g., see Figure 5D). Spines on the distal dendrites were counted in an unbiased manner from these cells (e.g., see Figure 5D). The spines on distal dendrites of every fifth branchlet (random starting point) were counted and the dendrite length was measured. Brain hemispheres used for immunohistochemistry were sectioned sagittally on a cryotome (−20°C) at a thickness of 30 μm and stored in PBS. Sections were immunostained with rabbit anti-calbindin (1:2000, Invitrogen, Waltham, MA) as the primary antibody and donkey anti-rabbit AlexaFluor 488 (1:300, Invitrogen, Waltham, MA). Sections were counterstained with 4',6-diamidino-2-phenylindole (DAPI, 1:100, Invitrogen, Waltham, MA). The sections were mounted on Fisherbrand SuperFrost microscope slides (Thermo Fisher Scientific, Waltham, MA) slides and coverslipped with VectaShield without DAPI (Vector Labs, Burlingame, CA). The sections were imaged at 10× magnification on an epifluorescence microscope and ‘virtual slices’ were constructed from serial images taken by the MicroBrightField software Stereo Investigator. PCs were counted and the length of the PC layer was measured for each sample using ImageJ. All data and samples were analyzed with by an experimenter who was blinded to genotype. All pairwise statistical tests were unpaired two-sample t-tests unless otherwise noted. Time course data were analyzed using two-way ANOVAs with repeated measures; main genotype effects were reported regardless of significance, whereas main session effects (which would indicate a learning effect through time) are significant and session × genotype interactions are not significant unless otherwise indicated. When comparing a single measurement across more than two groups, one-way analyses of variance were performed with Bonferroni post hoc tests with planned comparisons. Correction for potentially confounding variables (i.e., age) was performed using analysis of covariance tests with the confounding variable as the covariant and followed by Tukey's post hoc tests. Tests were performed using GraphPad Prism 6 (GraphPad Software, Inc., La Jolla, CA) and SPSS 21 (IBM, Armonk, NY). All data are displayed as mean ± standard error of the mean (SEM) unless otherwise noted in the text or legend. Where significant differences were discovered with pairwise comparisons, effect sizes are also reported as Cohen's d′. The Journal of Comparative Neurology 145:465–513. Current Opinion in Neurobiology 19:445–451. San Diego: Society for Neuroscience. International Journal of Developmental Neuroscience 23:189–199. The Journal of Neuroscience 21:5715–5722. Disease Models & Mechanisms 3:133–135. Molecular and Cellular Neurosciences 26:182–190. Frontiers in Cellular Neuroscience 3:19. In: A Amaral, D Geschwind, G Dawson, editors. Autism spectrum disorders. Oxford: Oxford University Press. pp. 611–631. Trends in Cognitive Science 10:294–300. Genes, Brain, and Behavior 9:213–223. Current Opinion in Genetics & Development 22:229–237. The Journal of Comparative Neurology 501:526–542. Cellular and Molecular Neurobiology 22:171–175. Proceedings of the 36th Annual Meeting of the Cognitive Science Society. Journal of Autism and Developmental Disorders 40:1227–1240. The Journal of Neuroscience 33:12599–12618. The Journal of Neuroscience 19:10940–10947. The Journal of Neuroscience 30:14805–14816. Journal of Autism and Developmental Disorders 25:1–18. The Journal of Neuroscience 34:14845–14853. Journal of Autism and Developmental Disorders 40:937–945. The Journal of Experimental Biology 204:2439–2446. The Journal of Neuroscience 33:18448–18468. The Journal of Neuroscience 24:3242–3250. Journal of Autism and Developmental Disorders 37:894–910. Progress in Brain Research 210:79–101. 224, Frontiers in Human Neuroscience, 4, eCollection 2010, 10.3389/fnhum.2010.00224. Current Opinion in Neurobiology 21:616–622. The Journal of Neuroscience 21:4081–4089. Journal of Biomedical Informatics 44:S5–S11. The Journal of Neuroscience 26:319–327. The Journal of Neuroscience 26:12656–12663. Frontiers in Neural Circuits 6:1–24. The Journal of Cell Biology 162:1149–1160. The cerebellum: a neuronal learning machine? Journal of Autism and Developmental Disorders 45:376–394. The European Journal of Neuroscience 32:1537–1551. Journal of Autism and Developmental Disorders 24:737–751. Neurobiology of Learning and Memory 94:521–529. Progress in Brain Research 143:353–366. The Journal of Neuroscience 26:12861–12872. The Journal of Neuroscience 32:6525–6541. Current Protocols in Neuroscience, Chapter 8:Unit 8.26, 10.1002/0471142301.ns0826s56. Trends in Cognitive Sciences 2:322–330. Thank you for sending your work entitled “Convergence of multiple mouse autism models on shared multisensory learning phenotypes” for consideration at eLife. Your article has been evaluated by a Senior editor, a Reviewing editor, and three reviewers, and we would like to invite you to submit a revised manuscript. The Reviewing editor and the reviewers discussed their comments before we reached this decision, and the Reviewing editor has assembled the following comments to help you prepare a revised submission. This manuscript describes delay eyeblink conditioning in five mouse models of autism spectrum disorder. The authors point out that the cerebellar malformations are characteristic of autism and that this behavioral task depends on the cerebellum. They therefore test whether the mutation of autism linked genes alters the acquisition and execution of conditioned eyeblink responses, and demonstrate that this is indeed the case. On the one hand, one could argue that the results are obvious – if the genes are expressed in cerebellar cells (known) and the gene products have any effects on the neurons that express them (likely) then it is inevitable that changes in eyeblink conditioning will occur. On the other hand, a characterization of the specific deficits is informative, and since there has been resistance among autism experts to acknowledge a role for the cerebellum, it is valuable to gather such survey data to make the case convincingly. Overall, the Reviewing editor and referees agreed that this is an interesting, and potentially important study that could have a significant impact among cerebellum and autism researchers. The experiments are for the most part carefully carried out and well-presented. However, there were serious concerns about the validity of the conclusions that the authors draw from their data, as well as their presentation of the results. Addressing these concerns will require additional experiments and quantification to strengthen the association with ASD. In particular, they should test whether the severity of social deficits is correlated with severity of impairment in eyelid conditioning – this would significantly strengthen the paper. Also, if eyelid conditioning is a more sensitive assay than other cerebellar tasks, this would provide more support for their central hypothesis. Furthermore, the authors should drop their vague claim that eyelid conditioning is a model for “multisensory learning” deficits in autism. Instead, the authors should be more direct and realistic about the content and limitations of the observations. This involves including more discussion and/or data related to timing deficits or lack thereof and how this relates specifically to literature regarding eyelid conditioning in ASD patients. The Reviewing editor and referees agreed that final acceptance or rejection of the revised manuscript will depend on the outcome of the new experiments. 1) Is there any cerebellar test which is not multisensory? If so, please indicate which one and then subject one or two mutants to such a task, so as to increase the impact of the association created. 2) Is there any non-cerebellar test which is not multisensory? If so, please indicate which one and then subject one or two mutants that express the relevant genes in the non-cerebellar regions involved to such a task, so as to increase the impact of the association created. This might create a double dissociation and/or association. 3) The deficits observed in the mice do not appear to closely resemble those observed in autistic children or adults. Sears et al. reports deficits in appropriate timing of the eyelid responses, but faster learning and larger amplitude CRs in ASD patients. Another study (Oristaglio et al.) in children with ASD also reports timing deficits. The present manuscript does not present much data on timing of CRs, save some very small changes shown in Figure 6. Instead, the amplitude and probability of the CRs is smaller in some of the mice. It is not clear how to relate these differences to those observed in humans or how they fit with the well-documented role of cerebellar cortex in controlling the timing of CRs. This is a serious concern which needs to be discussed. 4) Altered gene expression is global in 4 of the 5 mouse models used. Given this, it is unclear how the authors can be sure the deficits are actually due to changes in the cerebellum. Relatively small differences observed in amplitude and probability could have many origins outside of cerebellum. This is a major shortcoming which needs to be addressed, as one of the main motivations of the paper seems to be to approach the problem of understanding the link between cerebellum and ASD. 5) The phenotypes are mostly relatively subtle, but at the same time compelling in that all ASD mouse models show some deficit. To what extent is the eyeblink test specific for autism? Wouldn't all specific cerebellar tests show some phenotype in the ASD mouse models tested here? Please note that tests like rotarod are not cell specific. 6) To strengthen the association between cerebellar behavioral deficits and autism, shouldn't the level of the behavioral cerebellar motor deficit be correlated quantitatively to the level of more authentic autistic behavior such as grooming, vocalization, repetitive behavior etc? If there is a positive relation between these levels, the association will be stronger. So please try to provide these correlations at a quantitative level (if necessary by digging into the literature). 7) Are there mouse mutants that do show cerebellar deficits, but no signs of autism (as described above)? Please indicate and/or show which ones. 8) Please provide a more detailed description of the precise cellular distribution of the expression of all five genes involved within the entire olivocerebellar system as well as the non-cerebellar regions involved in eyeblink conditioning (e.g. trigeminal and facial nucleus and red nucleus) in the Introduction, Methods or Results section (a table would also be nice), so the reader can better relate the phenotypes later on to the anatomy. The authors already did quite a good job on this point, but it can be made more extensive, which in this case is relevant as the models concern mostly global mutants. 9) What is the point was of measuring probability in two different ways, first as 15% of the UR and next from the integration of the non-failure distribution? The two analyses did not appear to give statistically different outcomes, and it remains unclear what was gained by the second analysis (or retaining the first analysis). After the description of the method and the report that the data are in Figure 3, nothing is stated as being learned. What is the purpose of including both? 10) Results (subsection headed “General eyeblink conditioning defects”): “These findings indicate that delay eyeblink conditioning can be used to further probe defects specific to the initial acquisition of conditioning, a process that requires the cerebellum.” This concluding statement from the primary experiment of manuscript does not make sense. The first half (conditioning can be used to probe conditioning) is tautological, and the second part (cerebellar dependence) was known before the experiments were done. The sentence also doesn't follow logically from the observation that extinction was normal and acquisition was altered. Statements like this give the sense that this is an archival set of measurements that were definitely worth making and may be of value in a deeper investigative context, but that there really are no major insights gained from the work. 11) It makes sense to measure both response probability and amplitude, since these may reflect different aspects of the learning, but the presentation of the data is bizarre and makes it hard to follow the point. In the subsection headed “Performance differences associated with olivocerebellar pathway perturbations”, it is almost as though another writer took over the paper. The text reverts to explaining the circuit, restates the purpose of the experiments, re-identifies the genes, and re-calls Figure 1. All the data that actually matter in the manuscript are in Figures 4 and 5 (and the raw traces of Figure 2 are helpful as well as illustrations of data that gave rise to these summaries). The plots of Figures 4 and 5 catalogue the defects associated with different genes (useful) but are not interpreted in a way that is particularly compelling. In the last paragraph of the aforementioned subsection comes the conclusion of three of the models, “Taken together, [these] models suggest that Purkinje cell disruption is accompanied by deficits in learning.” This is not a new discovery; it is a confirmation of something long known. It seems the cart is before the horse here; it is plausible that the discovery is that these autism-linked mutations alter the cerebellar circuit sufficiently to affect learning processes known to depend on the cerebellum. That the effect can be localized to Purkinje cells, however, is not convincing. 12) Ascribing the changes in amplitude in the MeCP2 and Shank mutants to the “mossy fiber pathway,” which means granule and Golgi cells, is not convincing. For Shank, given that the protein is expressed in the cerebellum only in granule cells (Figure 1), any changes in these cells may well contribute to deficits, but why this should affect amplitude specifically is not clearly justified. For the MeCP2 mutants, the more widespread expression does not make the link to the mossy fiber pathway make sense. Besides, as defined, the mossy fiber pathway is everything downstream from the mossy fibers, which encompasses the full cerebellum. It should also affect Purkinje cell activity, which the authors just said would necessarily affect response probability. A key piece of information missing is what the expression of all proteins is in mossy fibers, which are heterogeneous. Besides, without knowing what the nature of the signals made by Purkinje cells is under the different conditions, these types of conclusions cannot be drawn with certainty (this does not require redoing all the experiments with electrophysiological recordings; just being realistic in the written interpretations). Thank you for resubmitting your work entitled “Cerebellar multisensory learning defects in five mouse autism models” for further consideration at eLife. Your revised article has been favorably evaluated by a Senior editor, a Reviewing editor, and three reviewers. The manuscript has been improved but there are some remaining issues that need to be addressed before acceptance, as outlined below. The referees appreciated the effort the authors have made to address their concerns and agreed that the manuscript is much improved. However, it was felt that the authors need to go further in order to tone down the rhetoric in the discussion regarding eyelid conditioning representing a model system for multisensory learning. It is also strongly recommended that the authors drop “multisensory” from the title. Detailed suggestions for revision from the three reviewers are below. Job well done. All my major concerns have been addressed. Though I appreciate the authors' efforts and believe that the data in this paper will be useful for future investigations into the intriguing links between cerebellum and ASD, I still have concerns about the overall significance of the findings as well as the authors’ interpretation. Several other papers (Koekkoek et al., 2005; Murawski et al., 2009) have already documented deficits in eyelid conditioning in rodent models of autism and related disorders. These include a recent paper in Nature Communications from Piochon et al. (with some of the same authors as Kloth et al.) that documents eyelid conditioning deficits in one of the same mouse lines that is used in the present study. While it is true that the present manuscript shows that eyelid conditioning deficits are common to several different autism models, there doesn't seem to me any compelling pattern or mechanistic explanation for the various deficits that the authors observe in the various models. The facts that (1) the deficits are fairly subtle and vary across the different lines and (2) many of the disrupted genes are expressed outside the cerebellum and/or at multiple sites within the cerebellum make it impossible to link the phenotypes with known models/mechanisms of cerebellar learning. The authors’ attempts to make such links in the Discussion were not convincing. This kind of “statistical learning” is what one imagines is going on in cerebral cortex. For that matter, associating two closely spaced events could occur almost anywhere in the brain via Hebbian plasticity. One thinks about the cerebellum as a structure for supervised learning or learning from error. Virtually all real-life learning is multisensory, so I really don't see the specific connection to the cerebellum. Deficits in cerebellar function may well be playing a special/critical role in autism, as highlighted in Dr. Wang's excellent recent review. The idea of disrupted internal model learning is particularly intriguing in relation to the cerebellum-autism connection. However, I am not convinced by the multisensory learning/eyelid conditioning angle pushed here. Another concern voiced in my original review related to the unclear relationship between the eyelid conditioning deficits in mice and those reported previously in individuals with ASD. I appreciate that methodological differences complicate comparisons, but the fact that there is not a close alignment of the animal and human studies remains concerning to me. In the first round of reviews one of the reviewers commented that “…statements like this give the sense that this is an archival set of measurements that were definitely worth making and may be of value in a deeper investigative context, but that there really are no major insights gained from the work.” This statement sums up my overall feeling about this paper. To my reading, the authors have done a very good job in revising the manuscript. It is much more coherently written, accessible, and complete. The new data lend strength to the interpretations, and the reorganization and rewriting make it much easier to understand the authors' main line of reasoning. The data present a good case for how cerebellar learning is affected in specific ways by autism linked mutations. My comments are mostly minor. 1) Introduction, first paragraph. “Sensory responsiveness and social symptoms are strongly correlated in high-functioning autism patients.” It is not clear what is meant by “social symptoms” or how they would vary along an axis. 2) Figure 1B, 1C, please define and explain the red and blue (portions of the) records. I think blue is CS only in a trained animal but it is not explicitly stated. […] However, there were serious concerns about the validity of the conclusions that the authors draw from their data, as well as their presentation of the results. Addressing these concerns will require additional experiments and quantification to strengthen the association with ASD. In particular, they should test whether the severity of social deficits is correlated with severity of impairment in eyelid conditioning – this would significantly strengthen the paper. Also, if eyelid conditioning is a more sensitive assay than other cerebellar tasks, this would provide more support for their central hypothesis. Furthermore, the authors should drop their vague claim that eyelid conditioning is a model for “multisensory learning” deficits in autism. Instead, the authors should be more direct and realistic about the content and limitations of the observations. This involves including more discussion and/or data related to timing deficits or lack thereof and how this relates specifically to literature regarding eyelid conditioning in ASD patients. The Reviewing editor and referees agreed that final acceptance or rejection of the revised manuscript will depend on the outcome of the new experiments. We are grateful that the reviewers consider this paper a potentially significant contribution to two fields that seem to be on a collision course: ASD and the cerebellum. We have carefully taken their advice into account. We have reorganized the paper to emphasize the results before putting them into the context of cerebellar function. We have also carefully laid out how eyeblink conditioning – as opposed to other assays of motor performance or non-cerebellar learning and memory – can be a useful tool in understanding ASD pathophysiology. As described below, we have performed new experiments suggested by the reviewers and expanded the Discussion to help make this case. We performed new gait analysis experiments in three mouse models to evaluate motor performance that is partially influenced by the cerebellum. Importantly, this task does not require the multisensory associative learning that is modeled in delay eyeblink conditioning (although it is true that gait adjustment does require sensory feedback). As the reviewers point out, demonstration of a cerebellar, non-multisensory phenotype that is not affected by ASD-related mutations would strengthen our claim that the defects associated with cerebellar learning are particularly connected to the overall ASD phenotype. We found no significant gait differences in the three models we tested, as described (Table 1). In addition, we added information from the literature on gait and rotarod to strengthen our point (Table 2). We performed new swimming Y-maze acquisition experiments in three mouse models to evaluate learning and memory in a non-cerebellar task not typically related to ASD dysfunction. As the reviewers point out, demonstration that eyeblink conditioning does not simply represent a global defect in the mechanisms of learning would strengthen our claim that the defects association with cerebellear learning are particularly connected to the overall ASD phenotype. We found no significant swimming Y-maze acquisition differences in the three models we tested (Table 1). In addition, we added information on ASD-related cognitive differences in these mice (Table 2) to further strengthen our point. We agree with the reviewers that it is important to evaluate the potential clinical relevance of our findings. We have included two new paragraphs in the Discussion on this point (“Comparison with eyeblink conditioning phenotypes in autistic persons”). We have closely analyzed the sparse literature on eyeblink conditioning in ASD patients. While the literature does point out differences between our results and the clinical results – for instance, gains in learning function in ASD patients and loss of learning function in Fragile X patients, compared with loss of learning function in our mouse models – we believe that there are important limitations to the existing clinical studies. We explore these limitations in the Discussion, and suggest ways in which our results might inform expansion of the clinical ASD eyeblink conditioning literature. Finally, we note that the changes we have observed are quite comparable in magnitude to published findings from human subjects. In particular, differences in latency-to-CR-onset are in the same range as human literature. This is now discussed in the subsection headed “Comparison with eyeblink conditioning phenotypes in autistic persons”. We acknowledge that the global nature of mutations in some of our models could make our results difficult to interpret. We have added new discussion to examine how dysfunction of extracerebellar areas might account for our findings (“Extracerebellar sites”). At the same time, we also point out how cerebellar cell-type specificity in two of our models, L7-Tsc1 and Shank3ΔC, strengthens the cerebellar nature of findings with respect to ASD. We agree with the reviewers that eyeblink conditioning requires specific justification. This is now done, and as mentioned in our response to major point #1, we now provide information about other phenotypes that have partial cerebellar involvement (gait and rotarod) to emphasize our point about eyeblink conditioning: gross motor performance does not map to brain circuitry (Figure 7), or to ASD phenotypes (Table 2), with the precision of our delay eyeblink conditioning data. Furthermore, in the Discussion (second paragraph) we explore the advantages of using eyeblink conditioning as a probe of cerebellar function. We agree with the sentiment behind this question. However, assays of grooming, ultrasonic vocalization, and social deficits vary between labs, making it difficult to make even a rank-order comparison. Despite this difficulty, we did collect what information we could. We now supply extensive information about the ASD phenotypes from the literature, including the direction and the significance of the results (Table 2). We suggest that a qualitative point stands out: delay eyeblink conditioning is the one non-cognitive phenotypes that correlate strongly with cognitive and social deficits. This strengthens the specificity of the link between cerebellar learning and ASD function (end of Discussion, “The cerebellum in cognition and autism”). This possibility has been explored by Galliano et al. (2013). In their experiments, they find no such link, putting it seemingly at odds with Tsai et al. 2012, as well as our own findings. We discuss contrasts among these studies that might be resolved in the future (in the last paragraph of the subsection headed “The cerebellum in cognition and autism”). In the Discussion, we provide a more extensive description of the involvement of extracerebellar areas in this phenotype (“Extracerebellar sites”). We also provide additional information about gene expression in these areas (Figure 7–figure supplement 1). We have revised the manuscript to focus on only one method of analysis. We thank the reviewers for pointing this out. We have reorganized the Results section to remove such statements. We now use the Discussion section to show how the data fit into a framework of cerebellar function. We thank the reviewers for this comment. As mentioned in major point #10, we have reorganized the Results and Discussion sections to avoid the problem described by the reviewer. We now describe more extensively the possible involvement of these genes in mossy fiber-granule cell function and put this in the context of basic research on granule layer function. We discuss the limits to the interpretability of our evidence in the Discussion (in the subsection headed “Putative substrates for performance defects: the granule cell pathway”). We thank the three reviewers and two editors for their detailed attention to our manuscript. In the revised manuscript we respond to all remaining comments. Specifically, the word “multisensory” no longer appears in the manuscript. In addition, we have rewritten the last paragraph of Discussion to get away from the multisensory concept, which we agree was too broad. We disagree strongly. It was by no means a foregone conclusion that we would discover delay eyeblink conditioning deficits in every model that had ASD-like phenotypes. We have also demonstrated several types of dissociation (for which we are grateful to the reviewers for suggesting we do). We are now confident that our findings are significant and nontrivial. We agree that the cerebral cortex is a prime suspect for engaging in statistical learning. However, to our knowledge it is unknown whether the information processing that supports such learning is performed entirely by one brain region, or distributed in some manner across brain regions. We have rewritten the last paragraph of Discussion to remove the word “multisensory” and to link the work to temporally precise associative learning. We have also removed “multisensory” from the Title and the rest of the manuscript. In response to the original review, we added a thorough discussion of human eyeblink conditioning. We pointed out areas that require future experiments, and concluded that “past findings suggest that perturbation of cerebellar granule cell layer activation may be common in both idiopathic and syndromic autism, with impacts that vary by specific genotype and disease model.” We have now added text to make an explicit mouse-vs-human comparison. The text appears in the subsection headed “Comparison with eyeblink conditioning phenotypes in autistic persons”. In the face of this, we thank the reviewer for his/her willingness to provide a vigorous critique. Reworded to reflect the original Hilton et al. paper. The caption is now repaired. We have altered the text to reflect a more correct understanding of extinction and savings. This work was supported by R01 NS045193 (SSHW), the Nancy Lurie Marks Family Foundation (SSHW and MS), Simons Foundation Autism Research Initiative awards (221582 to SSHW and 203507 and 311232 to CH), New Jersey Commission on Brain Injury Research CBIR12FE1031 (AG), a Brain Research Foundation grant (CH), Autism Speaks (MS) a CREST grant from the Japanese Science and Technology Agency, and a KAKENHI grant from the Ministry of Education, Culture, Sports, and Technology of Japan (TT) and F31 MH098651 (ADK). The authors thank JF Medina, I Ozden, and T Schoenfeld for discussions and advice, R Jones for technical support, B Deverett for software and image analysis assistance, and LA Lynch for animal and histology support. Animal experimentation: All experiments were performed according to protocols (#1943-13) approved by the Princeton University Institutional Animal Care and Use Committee. All surgery was performed under isoflurane anesthesia, and every effort was made to minimize suffering. © 2015, Kloth et al. Andrew JP Fink et al.